The most dangerous enemy faced by the Federation is the Klingon Empire, and yet the Klingons don't regard the Federation as their priamry threat! There is much more to them. * History of the Klingons: How Kahless conquered the planet, the Old Kings who took the Klingons into space, then stranded them back on their homeworld, how they returned to the stars and conquered a mighty empire. 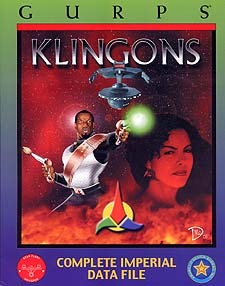 * Complete Racial Profile: Everything there is to know about the Klingons. Biology, culture, military, government, emperors, religions, economics, legal system, Imperial Paladins, military nobility, intelligence agencies, Secret Police, and more. * Planet Survey: Complete data on 23 Star Systems and over 100 planets. Klinshai, warrior colonies, subject races, industrial worlds, and more. * Starships: Complete Space 3rd Edition data files for more than 100 types, classes, and special mission variants ranging fromthe mighty B10 Battleship to the tiny G2 police corvette. * Technology Files: Disruptors, agonizers, two-handed swords, six different daggers, complete deck plans for the G1 fast patrol ship, medals, rank insignia, and the dangerous but effective Mindsifter. * Adventure: Make a deal on Verlix Station, or risk your career on Lieutenant Thirek's experiment.